This week, we found out that Waldo actually eats more than just office supplies (who knew?) when we found him barbequing all of our unannounced alt models in the warehouse. Strangely enough, the smell of burnt plastic and spices made us think about one of our favorite new models. Hopefully it wasn’t the fumes. Looks like there wasn’t enough food to go around at the last bash; Lenny must’ve hired a catering service. This week, we’re taking a close look at Som’er’s favorite midnight snack: the Spit Hog! When designing a new model, we always start with a basic concept and a goal in mind. In this case, we wanted to go with something fun and exciting that gave the Big Hats more survivability without necessarily bringing brute force to the table. Staying alive isn’t normally the first thing that comes to mind when thinking about Gremlins (wrestling crocs before learning to walk comes to mind well before that). But even pigbrained moonshiners have to eat, and now Som’er is bringing his dinner along into battle. Gremlins have to do things their own special way, and healing is no exception. For the fellow Big Hats, the Spit Hog is essentially a mobile meal, providing Heals to nearby friendly models with his “Food’s Up!” Ability and more. If there’s a fight breaking out in a particularly dense part of the Bayou, that much pork (50mm of it!) can get in the way pretty easily, which is why we implemented the Hoist the Hog Ability to allow friendly models to move through the Spit Hog. Enemy models will just have to sit back and smell its roasted glory. If sitting back wasn’t good enough for the opposing team and the Spit Hog somehow falls in battle (or if Lenny gets particularly hungry), the Gremlin underneath all of that weight picks up a Boomstick and joins the fray with the Demise (I’m Done With This) Ability. When developing Crews and their associated Abilities in M3E, finding a focus that fits both mechanically and thematically is always an interesting challenge. Som’er and his Big Hats, however, came pretty naturally; the idea of Gremlins quitting their job in the middle of battle while swarming the table with waves of Bayou Gremlins has been Som’er since the start. The Spit Hog isn’t just a hot meal passively waiting to be eaten on the table, though. With the Smack with a Roasted Pig melee Action, he can play a more active role in a Crew, healing or dealing damage as it pleases. The sweet smell of freshly salted pork also makes it more al-Lure-ing (read the back of its card above to understand this deliciously layered pun). Waldo’s full up on puns and pork this week. 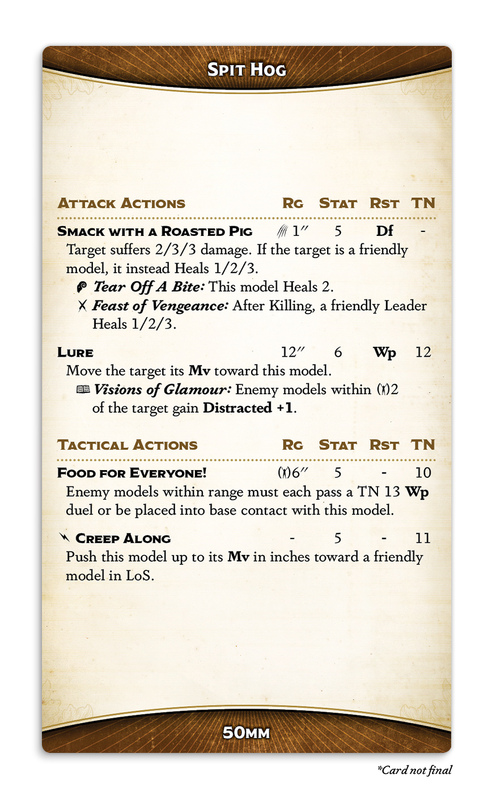 But before we go, check out what the Spit Hog will look like on the table below! Next week, we’ll be shining a light on a shadowy figure under Lucius’ thumb.